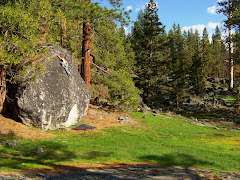 I am posting this blog as a way to keep my friends, family, and fellow climbers updated on what's going on in my life and what's going on in the tahoe bouldering scene. Tahoe has so many boulders it is kind of nice having them all to myself but I figure it is time to start sharing what's going on around here. Enjoy my blog.